Brazilian Leader Postpones State Visit Over Spying Concerns : The Two-Way President Dilma Rousseff was scheduled to visit President Obama on Oct. 23. She was set to be the first state visit of Obama's second term. 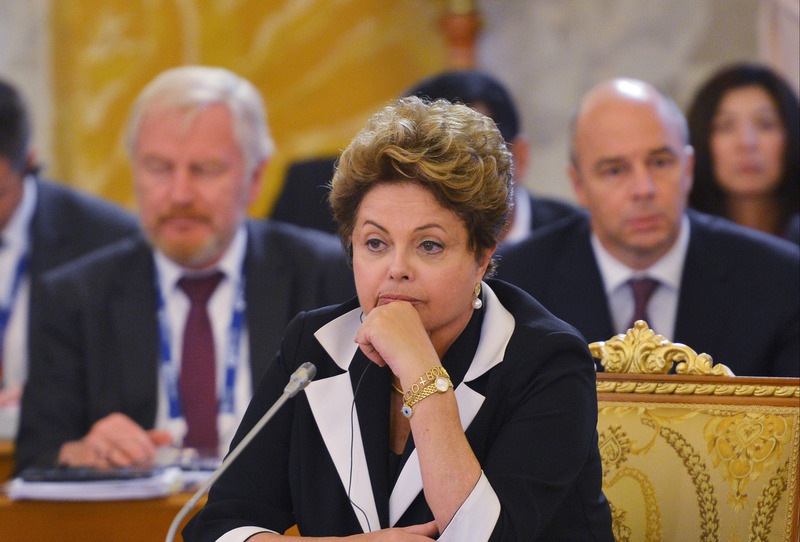 Brazilian President Dilma Rousseff attends the first working meeting of the G-20 summit in St. Petersburg, Russia, on Thursday. Brazilian President Dilma Rousseff said Tuesday that she would not travel to the United States for a state visit on Oct. 23. It is the first concrete diplomatic consequence of the revelations made by NSA contractor Edward Snowden, who revealed widespread spying by the U.S. government on foreigners. The Brazilian newspaper O Globo reported that Rousseff spoke to President Obama by phone on Monday for 20 minutes. Rousseff, the paper reports, "liked" the conversation, but she was still concerned about reports that the NSA intercepted the email communications of Brazilians, including her own. In a statement, Rousseff said the state visit should not happen in the "absence of a timely investigation of the incident." As we've reported, the White House has tried to assuage Brazil's concerns over the past few weeks. Rousseff and Obama met on the sidelines of the G-20 meeting in St. Petersburg earlier this month. That meeting failed to calm the waters and Brazil asked for a formal apology from the U.S. government. In its own statement Tuesday, the White House said the U.S. relationship with Brazil is important. That is evident, the White House said, because Obama invited Rousseff to be the first state visit of his second term. "The President has said that he understands and regrets the concerns disclosures of alleged U.S. intelligence activities have generated in Brazil and made clear that he is committed to working together with President Rousseff and her government in diplomatic channels to move beyond this issue as a source of tension in our bilateral relationship. As the President previously stated, he has directed a broad review of U.S. intelligence posture, but the process will take several months to complete. President Obama and President Rousseff both look forward to the State Visit, which will celebrate our broad relationship and should not be overshadowed by a single bilateral issue, no matter how important or challenging the issue may be. For this reason, the presidents have agreed to postpone President Rousseff's State Visit to Washington scheduled for October 23."